Only members of a small class of PC enthusiasts will spend $500 on a graphics card. You have to have pretty stringent requirements--perhaps a large high-res monitor or two or a taste for extreme image quality--to make use of that sort of performance. Most modern games run well enough on a graphics card costing half as much. 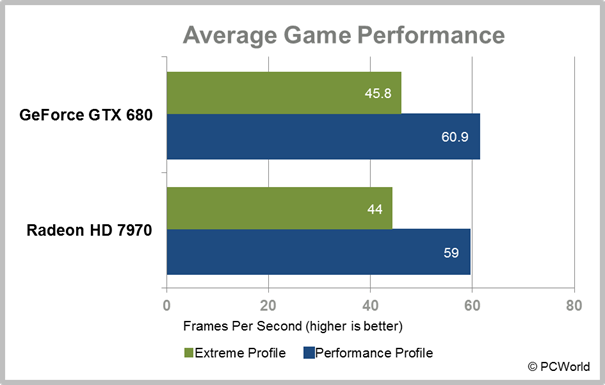 But if you're not satisfied with "well enough," the GeForce GTX 680 may be for you. Among expensive graphics cards, it takes the crown for delivering the best performance, with excellent features and very impressive energy efficiency. The GeForce GTX 680 is Nvidia's first card to incorporate a new graphics chip architecture, code-named Kepler. It's similar to the Fermi architecture found in the GeForce GTX 580 and the GTX 480 before it. Nvidia has taken the fundamental principles of the Fermi architecture and reworked it for greater efficiency, improving performance per watt and performance per square millimeter. The Fermi chips are also manufactured on a smaller 28-nanometer process, whereas the GTX 580 was made on a 40nm process. The 28nm process means lower power draw, higher clock speeds, and more-densely-packed transistors. In fact, Kepler is considerably smaller than Fermi at less than 300mm2 (full-size Fermi chips are 520mm2). The new GPU reduces the amount of control logic in each cluster of stream processors, sacrificing some potential performance in GPU-based general computation for better performance in 3D graphics applications. The resulting chip has three times as many stream processors of Fermi, twice as many texture units, and a clock speed of just over 1GHz. There are fewer render back-ends and a narrower memory bus, but those limitations are offset by the higher clock speeds. Nvidia harnesses these features to produce a high-end graphics card that delivers industry-leading graphics performance while drawing very little power (for a card in its price range).The GeForce GTX 680 is so energy efficient that the standard board design features two six-pin PCIe power plugs, whereas most $500 graphics cards require one six-pin and one eight-pin to supply enough power. Nvidia is introducing a handful of new technologies with the 600 series GeForce cards, too. GPU Boost is very similar to the Turbo Boost and Turbo Core technologies you find in Intel and AMD processors: If the card is running fairly cool and not drawing too much power, GPU Boost automatically bumps up the clock speed for better performance. AMD does this with its graphics cards, and it's nice to see Nvidia adopting the concept. A new form of antialiasing, called TXAA, should help provide smoother edges with less of a hit to performance than other forms of antialiasing impose. Our tests show it to be a very good tradeoff between performance and quality. Adaptive vsync is another nice compromise between the smoother performance of having vertical synchronization disabled and the artifact-free gaming of enabling vsync. Of course, if you're in the market for a $500 graphics card, you're primarily concerned with how fast it is. The good news is that focusing on energy efficiency hasn't cost Nvidia the performance crown. 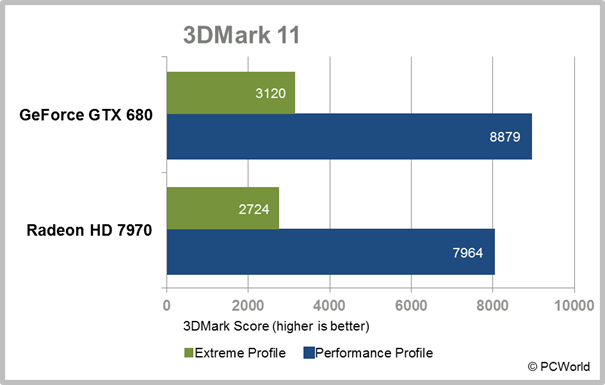 The GeForce GTX 680 manages to outpace its obvious competitor, AMD's similarly priced Radeon HD 7970, in most of our tests. 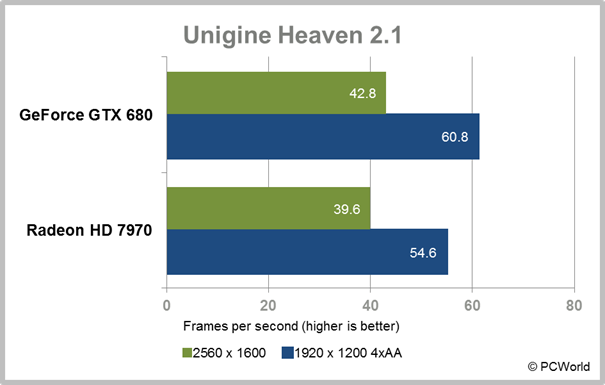 The improved tessellation performance in Nvidia's new chip helped it shine in synthetic tests like Unigine Heaven. It cranked out a very impressive score in 3DMark 11, too. When we average the performance of the two cards among four popular, modern, demanding games--Crysis 2, Just Cause 2, Dirt 3, and Metro 2033--we see the GTX 680 just barely edging out the Radeon HD 7970. In some games it's a bit faster, and in others it's a bit slower; but the overall performance is a little higher. This is with a graphics card that is slightly cheaper (around $20 to $30 less if you shop around online) and uses a tad less power. At the end of last year, we praised AMD's Radeon HD 7970 for its extremely high performance and fantastic energy efficiency. 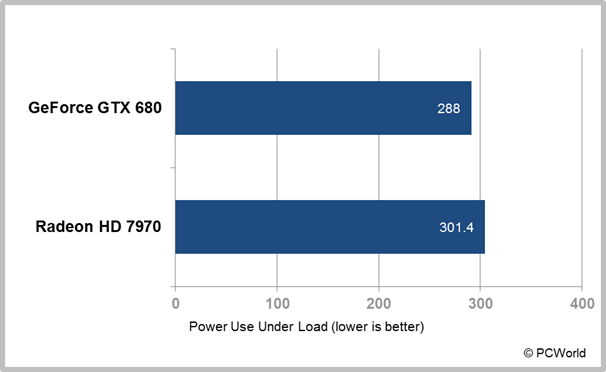 In the months since then, AMD has improved the card's performance further with driver updates--and yet Nvidia's new GeForce GTX 680 still manages to beat it on both counts, typically drawing less power and delivering slightly faster performance. Those advantages, together with the new TXAA and Adaptive vsync features, make it a clear winner. AMD's 7000 series relies on a graphics architecture that is drastically different from previous AMD chips, so we may still see much better performance with driver improvements; but right now, if you have $500 to spend on a graphics card, the GeForce GTX 680 is the better buy. If you're the kind of enthusiast gamer who will spend $500 on a graphics card, this is the one to buy.